On this week’s Two-Stroke Tuesday we take a look back at the best 125cc 2-Stroke projects of 2018. Do you have a favorite? Tell us about it @dirtbikemag on Instagram or Dirt Bike Magazine on Facebook. Products from Defunkify, MSV Racing and a free link to download the 2019 Leatt Powersports catalog are featured in 2-Stroke Hardware and you don’t want to miss 2-Stroke theater this week. 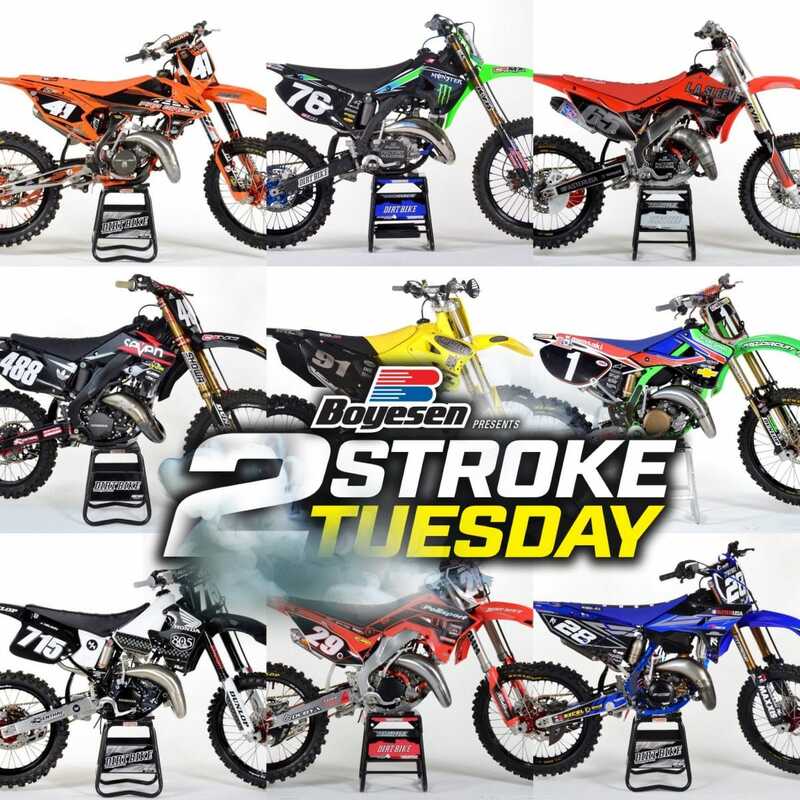 If you are a fan of 125cc 2-Stroke machines then check out the exclusive link at the bottom of this post. Everything on this 2001 RM125 was either replaced, rebuilt or refinished. The frame, swingarm and subframe was coated by Chris Johnson’s crew at San Diego Powder Coating. The frame has metal flakes that sparkle in the sunlight. Click the image to see more! This Honda CR125 looks like your average project build at first glance but if you take a closer look it will surprise you! The CR125 engine has huge amounts of work done inside and out. The outside features a black Cerakote finish that matches the overall theme. The FMF Factory Fatty stands out like a diamond in the sea of black. Click the image to see more! We see a lot of replica builds from all over the world but this one has got tons of meaning behind it. Growing up is Australia Blake “Bilko” Williams was a huge fan of American motocross scene and in the early ‘2000s PC Kawasaki’s had it all and it shows through in Bilko’s build. Click the image to see more! The Faster USA 2006 Yamaha project started out as a $1,500 purchase on Craigslist and ended up as one of the trickiest YZ125 builds we have ever been apart of. Check out that frame powder coated a metallic blue by San Diego Powder Coating. Click the image to see more! Everyone knows Jessy spent a lot of his amateur career on a Honda and 1994 was the year he was born so when he found this bike it was meant to be. Originally it was going to be a fun restoration but he quickly realized help would be needed. Thats when Jessy called Justin Myerson from Moto Whips and teamed up with 805. Decal Works topped the build off with a completely custom graphics kit and all black seat cover. Click the image to see more! Frenchie at C4 MX rebuilt this Kawasaki KX125 for his son to rip around SoCal. As you can see, it has some targeted upgrades in key places, but a lot of the stock parts were cleaned up and used as well. Click the image to see more! The Polisport restyle plastic kit will work on 2002-2007 Honda CR125/250 models and bolts right up to the existing stock frame and tank. No modifications required. This build features a semi-custom graphics kit with gripper seat cover from Decal Works. Both the plastics and graphics can be bought from Decal Works. Click the image to see more! Pro Circuit put a ton of time into developing the engine on our KTM125 including designing a new exhaust that not only produces more power but is also lees likely to be damaged. The crew at WP dialed in the AER Cone Valve fork and Trax shock for out specific application and the Pro components are worth every penny! Click the image to see more! Yes this is a 2001 and no the Polisport CR Restyle kit does not bolt right up. This project was updated with 2003 gas tank, subframe and airbox before the Polisport kit was installed. As you can see there are a host of companies involved on this build including Bolt Motorcycle Hardware, LA Sleeve, Faster USA, Factory Connection, Tag Metals, TM Designworks, Maxxis Tires, Boyesen, Samco Sports and the list goes on. Click the image to see more! The Endurance kit from Defunkify comes with their Active Wash laundry detergent, Active Spray gear Deodorizer and Active Shield laundry booster. All Defunkify products are the collective brainchild of Oregon scientist, chemists and inventors with a shared passion for an active lifestyle. The “phi” impeller vanes are computer designed using “Golden Ratio” proportions based on the CR500’s H2O pump housing and then CNC machined out of 7075-T651 Billet aluminum. 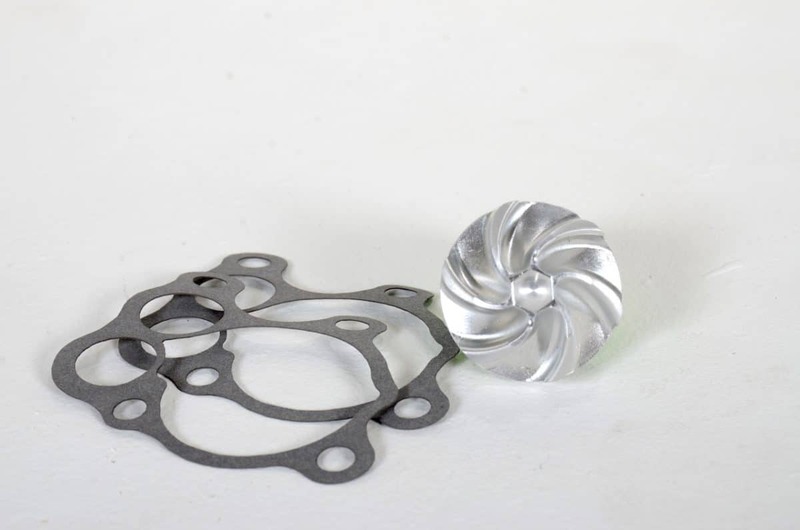 Water pump cover gasket set is included with every MSV impeller. Click the image above to download the 2019 Leatt Powersports catalog. If you like the 125cc builds featured on this week’s Two-Stroke Tuesday check out our CR125 Dream Bike build. Click the image below for more!